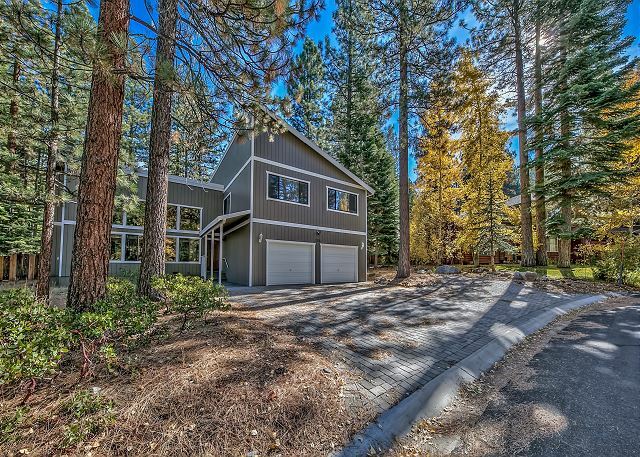 The Meadow Drive Home Features 5 Bedrooms In Beautiful Lake Tahoe Nevada, located a short drive to Lake Tahoe, the Heavenly Village, dining and entertainment options. Heavenly Ski Resort Stagecoach Lodge and Boulder Lodge are 3.7 miles away. The Meadow Drive home is a perfect family getaway in any season, an easy drive to the beach or to skiing. 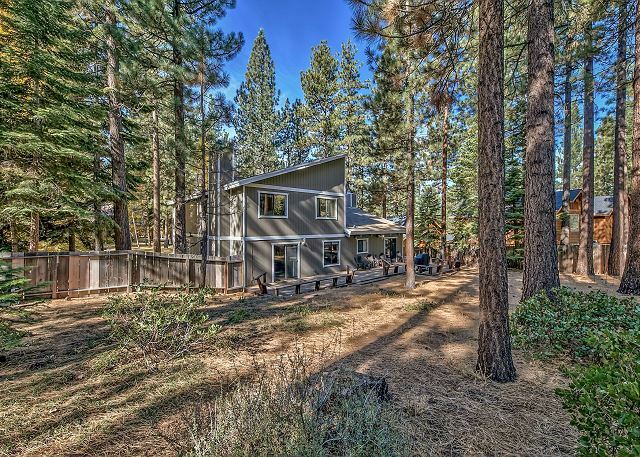 This home is located in a quiet residential neighborhood, but is near some favorite Tahoe dining options: The Red Hut Cafe, Motts Canyon Tavern and Grill, Clyde's Coffee Roasting Co. and The Chart House to name a few. Nevada Beach is approximately 6-10 minutes away. 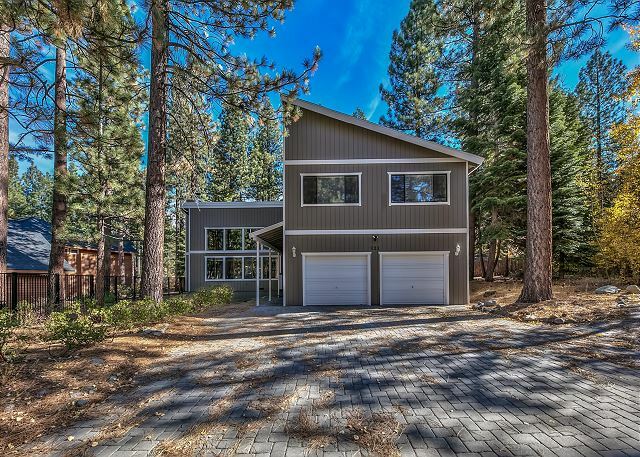 The Meadow Drive home features an open living room with soaring pine ceilings, a comfortable couch, flat screen TV and a wood burning fireplace. The soaring windows add natural light. 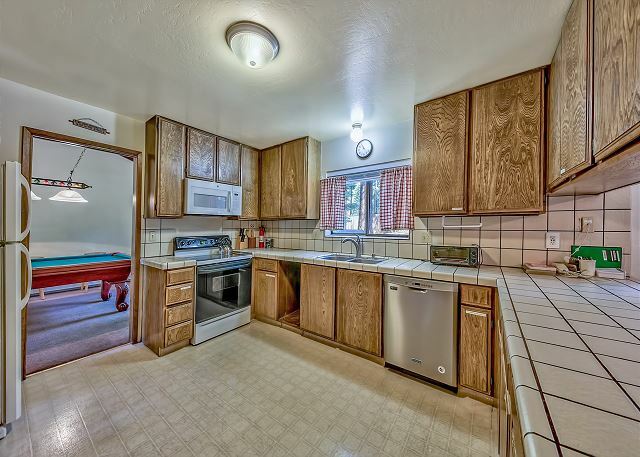 Adjacent to the living room is a game room with a pool table. 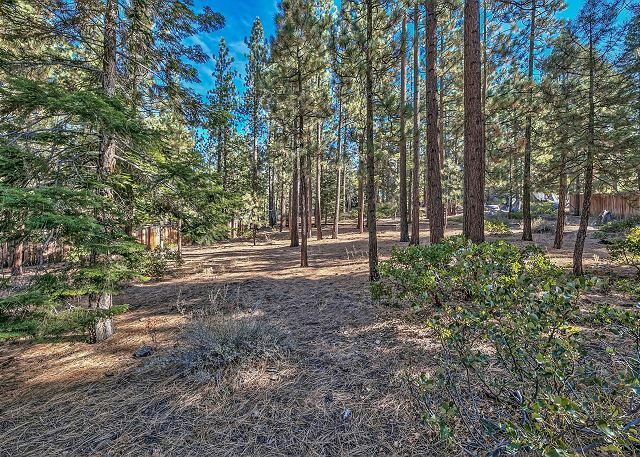 Off the game room is a large deck that runs the width of the home, the yard opens to trees and boulders to explore. The kitchen is well set up for chef preparing the family feast. Off the kitchen is a dining area that seats 10, plus a few more at bar stools at the kitchen bar. 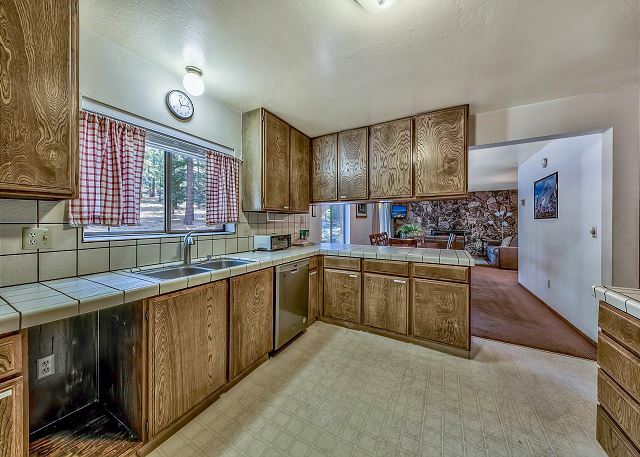 The three gathering areas on the entry level make this a great family retreat. There is one bedroom and full bath on the entry level perfect for guests who don't like stairs. The sitting room off the dining room has a wood burning fireplace and flat screen TV. The first floors also includes bedroom #1, a bath with shower stall and laundry. The second floor has 4 bedrooms. 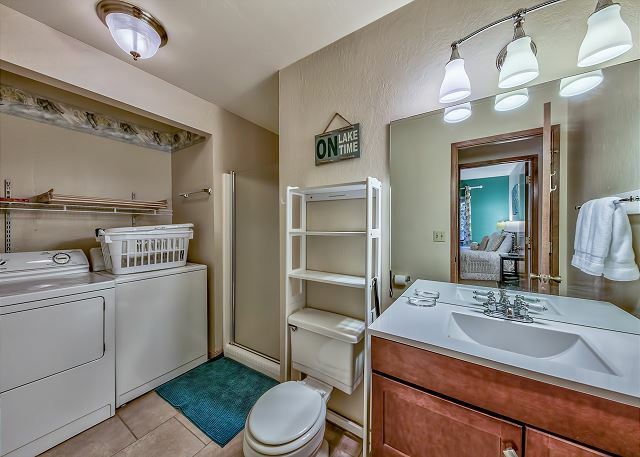 These three rooms share a hall bath with a tub/shower combo. 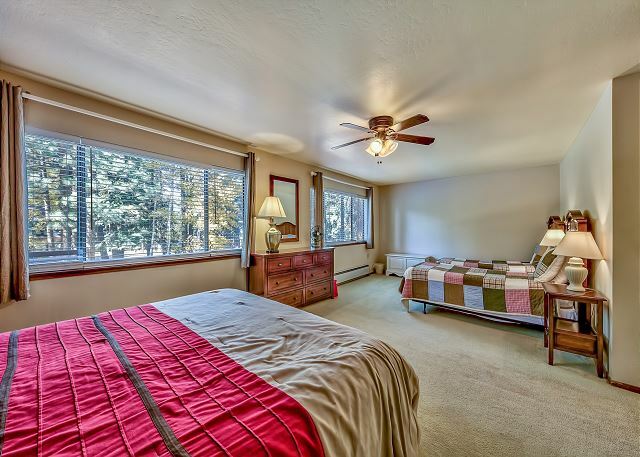 Bedroom 5: Master suite with Cal King Bed and 2 twin beds ensuite bath with dual sinks, bathtub and separate shower. If you family is looking for a peaceful retreat, with room for everyone to relax, the Meadow Drive home is the spot for you. 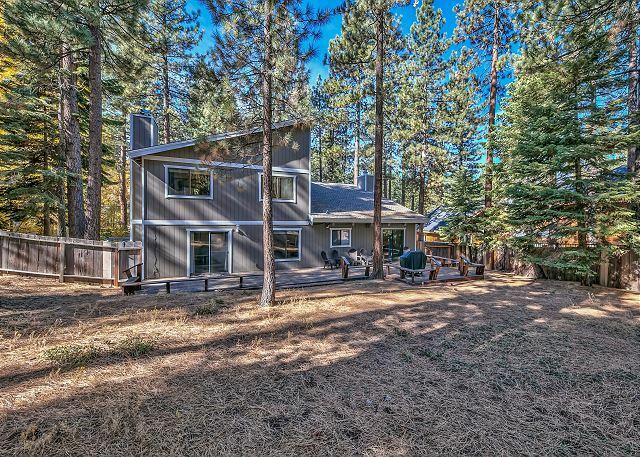 This home is located a block from Kingsbury Grade so easy access during snow season. Parking: 5 vehicles allowed, driveway and garage. No street parking allowed. We stayed at this home for our family Christmas trip. We had plenty of space here. We had 12 guests & we were all satisfied with our stay. 2 fireplaces was so nice & also having a pool table was a plus. The kitchen was fully stocked with all the cooking supplies, pots, pans, dishes, utensils. the location couldn't have been any better. close to down town Tahoe & Heavenly. It snowed on Christmas eve, so Christmas day, we all played out in the back with some sleighs that were in the garage. Very nice stay. Could have been a touch cleaner, also my daughter lost her watch, she thinks she left it there or it fell out of her bag. Would def stay again. Thank you for the notes we appreciate the feedback. We did not find a watch, but we can double check again. Loved this place with its big backyard, closeness to the casinos and various rooms. The biggest perk was being able to let the kids play in the backyard using the sleds offered by the owner. Way better than going to the snow park!! Thank you so much for the notes, we are glad you enjoyed your stay and hope you visit with us again.